FTMSGlobal, the Singapore-based education enterprise that began in 1986, now has 13 campuses in 10 countries in Asia and Africa, providing professional accounting and finance courses and other areas as well. Founder Balbeer Singh Mangat has come a long way from the farm in Kluang, a little Malaysian town, where his parents reared cows and sold fresh milk for a living. Over the years, he has also served as president odf Singapore Khalsa Association and was involved in the early days of Punjabi teaching in Singapore. Where does one begin to talk about Mr Balbeer Singh Mangat? Should one discuss his professional foresight and business acumen, which has seen him take his Chartered Accountancy qualiﬁcation and turn it into a multi-million dollar education and training business? Or should one start with his civic consciousness that has seen him do more than his fair share of society and community work? Yet still one could talk about how this man walks the talk by not just being a raving football fanatic but actually investing time and money to manage a local football team in the S-League. These are just some of the things that make Balbeer the highly respected member of society that he is today. This self-made man is a long way from the little Malaysian town that he once called home. Balbeer grew up on a farm in Kluang where his parents reared cows and sold fresh milk for a living. As such, his early education right up to the GCE ‘O’ Levels were completed there, followed by the GCE ‘A’ Levels in English College in Johor Bahru. Life changed in a big way when his parents decided to send him abroad to complete his GCE ‘A’ Levels in Newcastle Upon Tyne, in North England, instead. University, of course, followed shortly after and here is where we begin to see this captain of industry take the helm and steer himself towards a path that sets the course for the rest of his life. After a false start doing one year of mechanical engineering at the University of Newcastle Upon Tyne, Balbeer decided that it just was not his cup of tea. Rather than languishing quietly in that department or dropping out abjectly, young Balbeer went to the Economics Department and made an impassioned plea to the Dean on being allowed to change courses. It worked. The Bachelor’s degree in Economics and Accounting was followed with a Chartered Accountant accreditation from the Institute of Chartered Accountants in England and Wales and the rest, as they say, is history. Professionally, Balbeer has had a long and thriving career, the heights of which are still being charted. As a freshly qualiﬁed Chartered Accountant in 1982, he joined Arthur Young & Co. In addition to being good at his principal job, Balbeer explained that he always had an interest in training and research. Whenever he could, he would be involved in imparting knowledge to colleagues in his team. For instance, whenever there was an audit or accounting problem, he would be the one to conduct the research to ﬁnd a solution to the problem, and then conduct a seminar for the rest of the team. However, three-and-a-half years later, upon being promoted to the position of principal of training, Balbeer decided to strike out on his own and become the sole proprietor of an accounting ﬁrm in Singapore. The ﬁrm which bore his name, B S Mangat & Co, was singled out by the the late Justice Choor Singh for being a “very successful medium-sized local practice”. 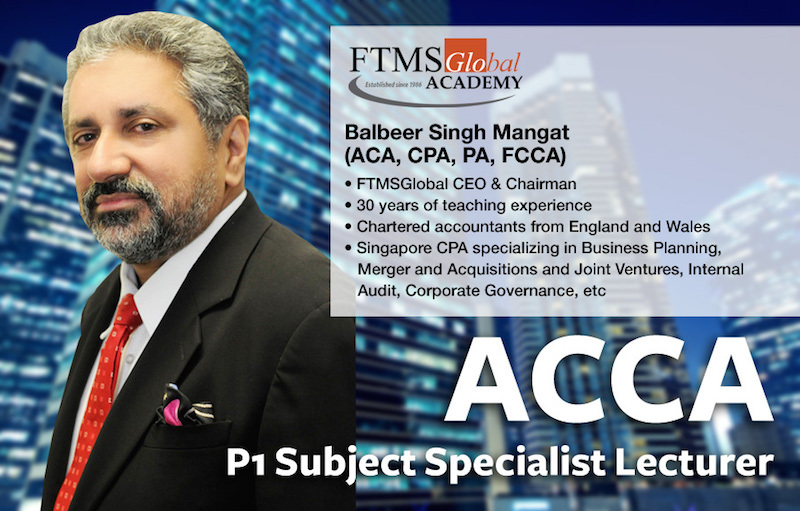 FTMS was thus born in 1986, the brainchild of Balbeer and three of his friends and fellow Chartered Accountants. However, after a restructuring, his three partners left the business. The accolades that FTMS has chalked up since then speak of one man’s determination to succeed. Some of the highlights included FTMS being awarded the Singapore Quality Class for Private Education Organisations ﬁrst in 2003 which has been renewed repeatedly, and most recently in 2014. A Business Times article counts FTMS as being one of the world’s top four providers of the popular Associated of Chartered Certiﬁed Accountants (ACCA) courses. In addition, in the spirit of innovation and in pursuit of their vision to be a World-Wide Premier Education and Training Provider, FTMS was the ﬁrst in the world to introduce e-learning for the ACCA courses in 1999. Going from strength to strength, FTMS has expanded from its initial outﬁt in Singapore to 13 campuses in 10 countries in Asia and Africa with 15,000 students annually. The role of a Chief Executive Ofﬁcer of a dynamic, fast-growing organisation such as FTMS may have preoccupied a lesser man to such a degree that he may have been unable or unwilling to spend time on other worthy pursuits. It was certainly not the case for Balbeer who has been a key member of the Sikh community for the last three decades. 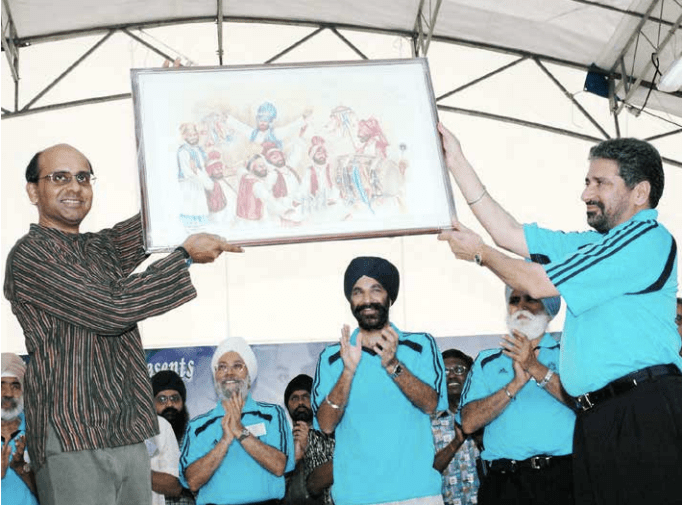 In addition to being President of the Singapore Khalsa Association (SKA) for nearly six years, Balbeer was part of a committee of like-minded Sikh professionals who were drawn together to take charge of the need for Punjabi education in Singapore and volunteer their skills for the good of the community. He recalls the team meeting regularly to formulate plans to institutionalise the teaching of Punjabi. This was the genesis of the Singapore Sikh Education Foundation. “I have known and worked with Balbeer for about 30 years. He broke the mould some 30 years ago, when he saw a pioneering opportunity to provide private sector higher education services at a time when the public sector, even in Singapore, had a virtual monopoly. Now his organisation has 13 campuses in 10 countries from Uganda to Hong Kong. His oversight of this empire remains unabated. Another major local institution that Balbeer helped to spearhead is the Sikh Welfare Council. According to Balbeer, the beauty of the Sikh community in Singapore is that whenever there is a need, everyone focuses his or her energies and pitches in to help. He saw this ﬁrst hand when the pioneering team started raising funds to set up the two aforementioned organisations. Balbeer was struck by individuals in the community whom the team had never met before coming forward with not just encouragement, but also resources to contribute to the worthy cause. This civic-mindedness and eagerness to involve and be involved in the community is a trait that is deeply ingrained in Balbeer and stems from the days of his youth back in Kluang. A very important part of his family’s visits to the temple was sewa (service) which would commence at two in the morning. One moment he remembers very vividly was being asked by the president of the Kluang temple to set up the Sikh Naujwan Sabha of Kluang. Balbeer gladly took on the responsibility and proceeded to raise funds for its purpose. Balbeer hopes to ignite the same spark of volunteerism in the Sikh youth of today and is constantly thinking of ways to encourage participation. The other thing that has followed him from youth through to adulthood is his love for the game of football. Although he never played football himself, Balbeer said that being in the United Kingdom for 10 years brought him to enjoy the game. The Co-Chairman for Balestier Khalsa in the S-League shares his position with two other men and they rotate the chairmanship. STILL CONNECTED: Balbeer still lectures. A poster taken from the RTMS website. To Balbeer, the football fraternity is a big family. During his time as team manager, he recalls being in the thick of things encouraging team spirit by fostering strong working relationships through post-match meetings, gatherings and providing motivation and support for the players and their families. Balbeer enjoys the whole experience of camaraderie and human interaction and explains that this is why he continues to be involved in the local football scene. Balbeer is undoubtedly an upright member of society and, as he pointed out, his greatest contribution to society may well be his attitude to life. Indeed, there is a lot to be learned from this go-getter who seems to have cracked the code on having a work-life balance and giving back to society and his community.